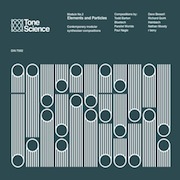 It has been said that a scholar collects, and so with his Tone Science series we find Ian Boddy (of DiN Records) continuing a fine job of just that. Now let us welcome Elements and Particles (60'23"), the second anthology of nine musical realizations that have never before been. The raw material of this art is electricity, which is forged into sound and music by dreamers and builders. Their wordless structures offer everything from technological complexity to the simplicity of a prayer. The artful sonic organization of the works found on Elements and Particles can stem only from a developed instinct. Timbre has always been a secondary consideration in music, yet in the field of Electronic Music it is the key medium of artistic spiritual intensity. In a genre this wild and ungovernable, each piece exerts its own specific force on the imagination. In an ever-fading atmosphere, the artists presented on this collection are shaping the character of sound in a thousand small ways. Finding their internal guidance the nine come alive to transform gently vibrating tones into a commotion of motion. As the worrisome low trill of LFOs gives way to a formless vacuum, another track goes bone deep cold. When chaotic modulations upset the spirit level of our minds, conventional access points recede - and we are left with only the sensation of hearing. There are also places of unspeakable beauty. In this innovative modular synthesizer realm, oscillators may sing of the quiet power behind their volume, with tempered circuits humming in ascent. Chirping rhythms echo lines of melodious machine patterns, and scatter above the round warmth of slower purple notes. In metallic voices and synthesized verse this gear can reference its technological founders, but in this worship we only diminish a power meant to amplify humanity - to further advance our state. The nine musicians represented on Elements and Particles always choose the light - as their lives are meant for discovery. With each new musical endeavor they dare to be more human. We may be considered mad by those who cannot hear the music - yet for all those who understand, it is a wonder beyond all dispute. But as steady as we are in our pursuit, we must wonder... what is this strange compulsion that drives us to create? We all do live this question, and must live into its answer.